There was a flurry of activity this week related to litigation over a 2014 Biological Opinion for salmon and steelhead in the Columbia River system, as defendant agencies led by the National Marine Fisheries Service filed briefs to meet a Wednesday deadline for doing so. The defendants, including the U.S. Army Corps of Engineers and the Bureau of Reclamation, and their supporters filed 11 briefs on Wednesday all seeking a summary judgement that would uphold the 2014 Biological Opinion for salmon and steelhead in the Columbia River Basin. Oregon U.S. District Court Judge Michael H. Simon is presiding over the case, and oral arguments are scheduled for June 23. The main brief filed by the National Marine Fisheries Service Wednesday contends that the plaintiffs "present a policy view of what they believe the ESA should require if they are writing on a blank slate, not a legal case on what the ESA does require ... Of course, Congress charged NMFS with the responsibility to administer and interpret the ESA, not plaintiffs." Briefs were filed in support of the defendant agencies by the states of Idaho, Montana and Washington and the Kootenai Tribe of Idaho and the Confederated Salish and Kootenai Tribes in Montana, the Confederated Tribes of the Colville Reservation in Idaho, in addition to other declarations filed by officials, experts and groups such as Northwest River Partners. 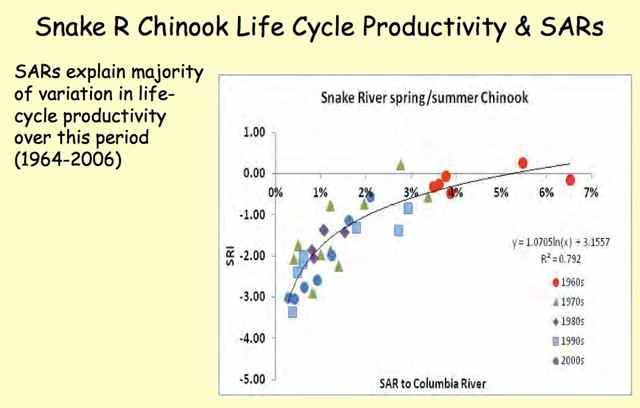 "NWF and its allies argue that they know more about the status of the species, have a better way to quantify uncertainty, have a sharper grasp of population dynamics and how to address climate change, and can predict more accurately than the (defendant agencies) with the specialized expertise how to determine whether habitat and hydro mitigation actions are delivering their intended results," Northwest River Partners asserted in its brief. The main plaintiffs in the case, the National Wildlife Federation and the state of Oregon, filed briefs seeking summary judgement in their favor in April. They were supported by a long roster of groups including American Rivers, Inc., Columbia Riverkeeper, Federation of Fly Fishers, Idaho Rivers United, Idaho Wildlife Federation, Institute for Fisheries Resources, NW Energy Coalition, Northwest Sport Fishing Industry Association, Pacific Coast Federation of Fishermen's Associations, Salmon For All, the Sierra Club and the Washington Wildlife Federation. They contend that the 2014 BiOp does not measure up to requirements set forth by the court when a 2011 BiOp was rejected, the third such BiOp to be struck down since litigation on salmon and steelhead recovery was initiated in 2000. The plaintiffs allege that the latest BiOp ignores "regionally supported sound science;" that it sets an illegally low-bar standard for recovery success; that it sidesteps court orders to do more to help salmon, including consideration of dam removal; that it allows dam operators to curtail flow augmentation that the plaintiffs believe will help salmon; and that it fails to address the effects of climate change. The brief filed by the defendant agencies this week maintains that the agencies have coordinated and collaborated with states, tribes and other stakeholders "to ensure that the biological opinion is scientifically and legally sound, and that implementation of recovery efforts are successful."